We meet a lot of strangers while traveling. The guy sitting next to you on the bus, the couple you keep on running into at the temples, a fellow traveler who just happened to be going in the same direction. It’s always up to you if you dare strike up a conversation and even more so, if you want to keep in touch. I've found that travelers do indeed cross paths at one time or another. And if you’re lucky enough, it happens more often than you think! Every now and then, I'll be writing about the people I’ve met while traveling and keep running into whether intentionally or by kismet. ‘Are you from Europe?’ , this friendly looking Caucasian guy asked while we were in line to pay at the restaurant. We had been ‘stranded’ at this restaurant for a few hours now, not knowing when our bus to Koh Samui would eventually start moving again. I wanted to reply: ‘Are you really looking at my brown skin and chinky eyes and asking me that?’ But I didn't. ‘I’m actually from the Philippines. What makes you ask that?’ I was eyeing him narrowly. Was this a pick up? I changed my mind when he said: ‘Oh really? I see the way you dress with the cargo pants and the backpack and I think maybe you are also from Europe. My girlfriend is actually from Philippines too. She’s over there.’ I looked at the smallish, tanned girl at the corner table and smiled. And that’s how I got to know Bing and Christopher. same transport package from Bangkok to the island of Koh Samui. 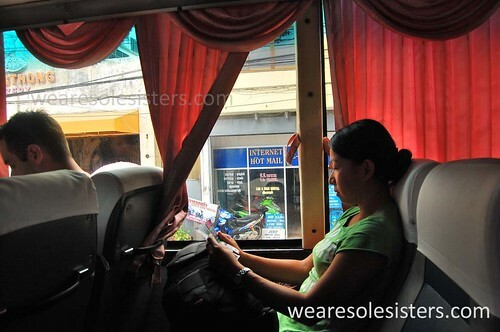 This meant we shared the same bus, van then ferry to Koh Samui for over 14 hours of travel. So we started talking. Bing was born and raised in Cebu, Philippines (just like Sole Sister Chichi) but she was now based in Bangkok. She met Christopher, who is originally from Paris, and they started traveling through Southeast Asia together. We were not going to the same area in Samui as they were going to Chaweng Beach and I was meeting my friend on Lamai Beach. Nevertheless, we were all going to the Full Moon Party in 2 days and we decided to meet up again in Koh Pangan. They both treated me like a little sister in tow. Bing and I hit it off instantly and talked in our dialect. Christopher taught me a few Thai phrases as he had lived in Thailand for so long, he was practically a local. They would wake me up when we had to transfer from one vehicle to the next. It felt great to have company and good conversation on the stretches that I was traveling solo. Upon arriving in Samui, they made sure I got on the right songtao to Lamai and we exchanged numbers. The next morning, while I was swimming, I saw a familiar looking couple on the beach in Lamai. Koh Samui was not that big of an island after all! The best part was hanging out at the Full Moon Party. We initially had a hard time finding each other as the beach was packed. But after a few phone calls, we finally did. Whoever said ‘It’s not about the places you go, but the people you meet’ is absolutely right. If travel is pad thai, the people you meet are the spices that go with it. They intensify and enrich your experience. And that’s precisely why I go backpacking and hardly go on organized tours. With itineraries and destinations less planned, I end up in many strange places and meet many interesting strangers. Strangers who never stay strangers for too long. On the next Strangers We Know, I’ll be writing about Mr. G, a jolly ‘stranger’ I met through a mutual friend in Germany. We went to several nights of wine festivals in Wurzburg and explored castles, little towns and vineyards. I didn’t realize I would see him again on ‘his island’ in the southern part of Thailand a year later. Have you ever started a conversation with fellow travelers? How did you find the experience? Share your thoughts with the sole sisters! Thanks for your (very elaborate) comment Eartha! I love chance encounters like that and NYC is really a great place to meet 'strangers'. Just yesterday in Bohol we met up with a group of Israelis in Panglao and spent hours chatting with them over San Mig Light. Maybe that would be another blog post. And of course, I'm thankful to Erwin for introducing you and Kaka (my other sole sisses). I'm sure we'll run into each other again soon!